Your engagement session is coming up. You’ve narrowed down a date and you’ve picked a photographer. Now all you have left to do is to figure out what you want to do! Your session doesn’t just have to be you and your fiancé standing around in front of something pretty. You can also choose to do an activity that holds a special meaning for you. Here’s a few things that my couples have incorporated into their sessions to be fun both for them and the resulting pictures! Do you and your partner love winter? Do you look forward to the first signs of cold weather every year because it means things are about to get cozy? Well, take that excitement with you to your session! 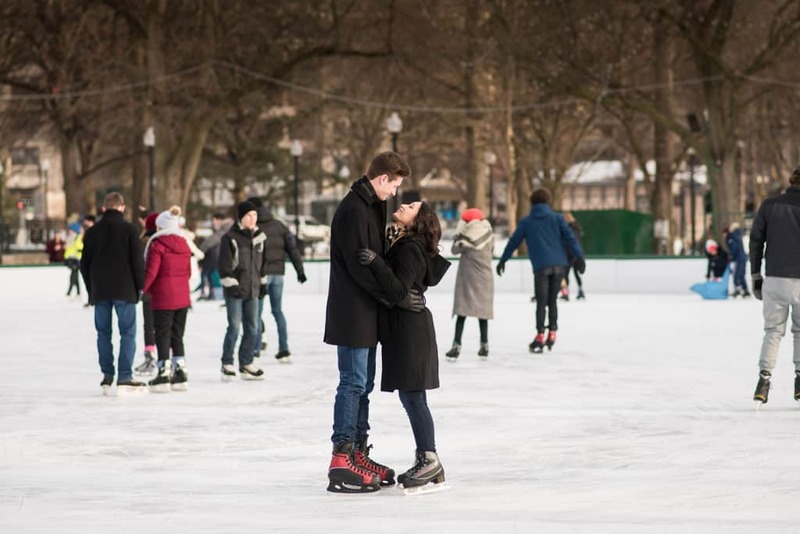 I’ve had many couples ask to go ice skating during their session and it’s always a bunch of fun. Do you guys like to hold hands and skate together? Do you guys like to show off those triple jumps and race each other? Let us capture your relationship all while having a great time. If this is something you love doing together every winter, let’s make it happen. If you and your partner in crime are more comfortable indoors, don’t just settle on sitting somewhere comfortable. There are a bunch of different location options inside! Bowling is a great activity. Whether you guys bowl every week in a league or just like to bowl for fun, your photographs will be fun, feel slightly nostalgic and be bright and colorful. This won’t just be a photo session, it’ll double over as a fun date! Do you have a pet that means the world to you? Let’s include them! 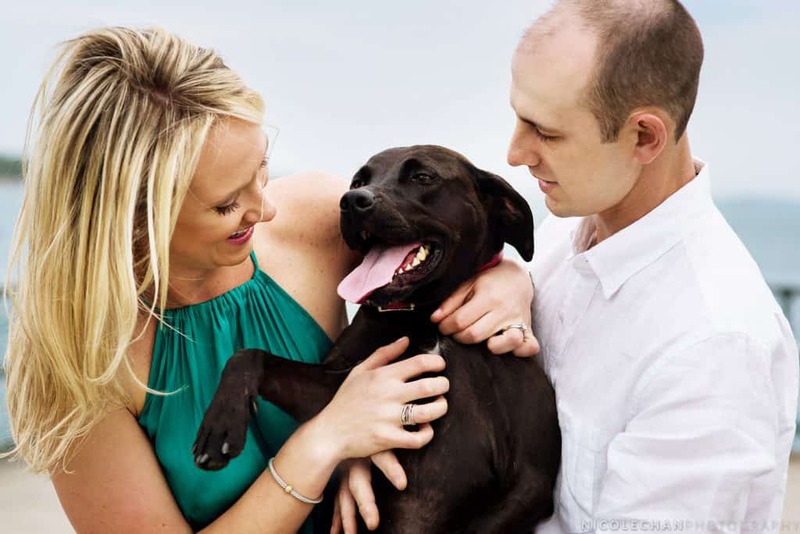 I love photographing weddings and engagements, and I also absolutely love pets. There’s always something special about photographing people with their animals because of the fun dynamic it creates. Whether you have a dog, a cat or even a bird, let’s try to capture some meaningful moments with them. You don’t necessarily have to go far to get great pictures. Sometimes the best location is right in front of you! If you love coming home after a long day of work, if your living room is your safest place, this is the perfect location for you. I love photographing couples in their own homes because of how much personality shines through. Surrounded by everything you love and feel comfortable in, you’ll be able to relax and forget about the rest of the world. No one will be there to watch you, it’s just you, your fiancé and me trying to be sneaky to catch those candids! If you live in New England, you know that the winter can be grueling. Because of this, spring and summer are some of the most gorgeous times to be here. If you love blossoms, sunshine and luscious grass – take your engagement session outside. Go for a picnic! Pack up all your favorite snacks, bring your favorite blanket and find a pretty spot to enjoy the day. Not only is this fun, it’s also very relaxed – and who doesn’t love to eat outside? This is the perfect idea for warmer weather. Do you absolutely love Boston and its iconic spots? Does Fenway mean something important to you? We can do something with that! If you and your partner love the Red Sox and the green monster, let’s take you there and get some photographs. Fenway Park is an amazing venue that is not just available for games. Many people choose it as a location to pop the question or tie the knot. Get dressed up in all your Red Sox gear and celebrate your love during this engagement session! Who knows, you might like it here so much that you decide to consider Fenway as your ideal wedding venue, too! I love unconventional ideas. Don’t get me wrong – as much as I absolutely love hitting up all the familiar photogenic spots Boston has to offer, sometimes doing something a little different is the way to go. A paintball photo session is the perfect example! If you and your fiancé have a favorite activity to do together, even if it’s uncommon, let’s capture that. I want to show the real you and what makes you happy together, as a couple. Going out and doing something energetic and crazy will make for fantastic images. Don’t think of this photo session as something traditional that has to get done. Instead, think of it as an opportunity to be as authentically you as possible. Whatever that entails!